Bird Sculpture in Caramel Calcite on Onyx Stand, "Sparrow of Creativity"
Standing on a black onyx stump, a sparrow looks to the world for inspiration. The sparrow is credited with encouraging creativity. Cesar Gonzalez sculpts the bird from caramel calcite, exquisitely detailing her wings. 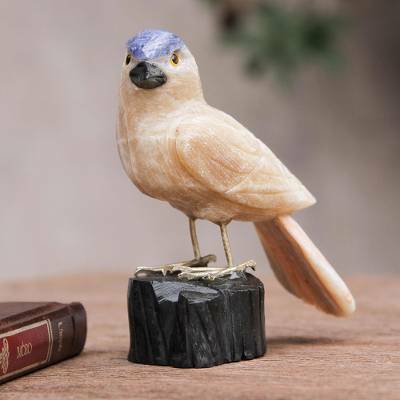 Featuring a sodalite crest, the sparrow's beak is shaped of onyx, the iron feet are painted gold and the eyes are made of glass. You can find caramel calcite sculpture 'Sparrow of Creativity' by Cesar Gonzales in sculpture categories such as Animal Themed Sculpture, Glass Sculpture, Metal Sculpture and Natural Gemstone Sculpture. Enjoy exploring these sections for other Novica treasures. I love this little sculpture it is really cute. The details, carving and colors are all really nice and it looks great on display on my desk! love to look at it great piece!